(Lanka e News - 01.Nov.2018. 11.30PM) The Attorney General (AG)has evaded giving an opinion on the most controversial and unconstitutional action of SIRA-MARA junta. The honorable speaker in connection with this grave violation wrote a letter to the AG on the 27th, a day after the incident calling for his opinion. 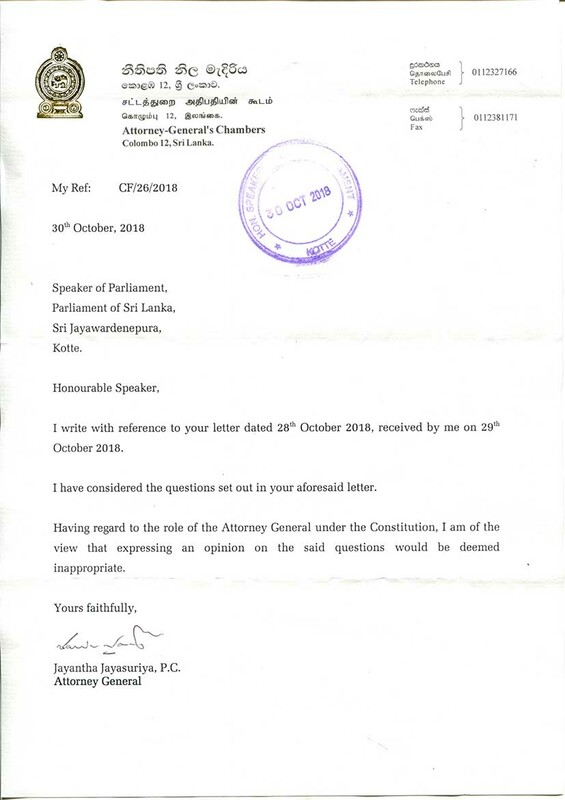 AG Jayantha Jayasuriya who took 3 days to answer has by letter informed the speaker , it is not appropriate to give an opinion at this juncture. The speaker issuing a communique in this connection has stated thus.. The AG had contacted the speaker and made a clarification in regard to who has the power to function as P.M. lawfully. However the speaker cannot reveal it , the latter added.. Our attention was drawn to the statements made by certain parties on 2018.10.29 . Those statements and the media reports that followed based on those were absolutely untrue and so far the speaker has not received any clarification of any sort. The AG in his response to the speaker’s request has sent a letter dated 30 th October under reference CF/26/2018. He had said therein , it is not appropriate within his role under the constitution to express his opinion .